I'll start right off the bat and let you know that tonight's dinner, Bean Burgers with Spicy Guacamole, has a fairly lengthy ingredient list and may look fairly involved, but I also think you shouldn't let that scare you away. Let's go find out why! 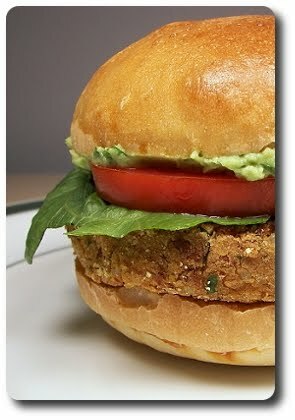 You'll find your usual suspects in this veggie burger - softened onions, garlic and beans - however, these patties are spiked with cilantro, rich smoked paprika (also found as pimenton) and cumin. That cumin wasn't just your ground variety you pick up at the market - we used whole seeds that we first toasted, then ground for more intensity. We also cooked a batch of pinto beans to use (I froze the rest in the bean's cooking liquid to use later on), but I imagine a tinned variety would work just fine. 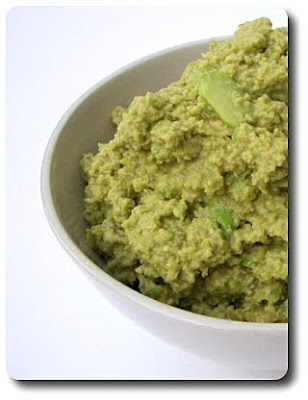 Instead of using, say, a food processor to whirl this bean-y mixture into a smooth puree, we just used a handy potato masher - this way we could control the texture and leave it a little coarse. This mixture is a little too sticky and wouldn't shape into burgers well as is - to help them hold together, we threw in a few tablespoons of cornmeal. That wasn't the only ingredient used for this - we also cooked a small batch of quinoa in vegetable broth and tossed that in to bulk and stretch the burgers. Cooked millet might also work for this, as may couscous if you can't find quinoa. I've been able to find quinoa in just about any market now though... they even have it at Costco! Now that the mash could be handled easily, it was divvied out into equal portions, with each being formed into a patty. To give the patties a touch of crunch to the outside, the burgers were then coated on each side with a little extra cornmeal. For added insurance, the assembled patties do go for a quick trip in the refrigerator to chill them down, firming the rounds before we went to cook them. 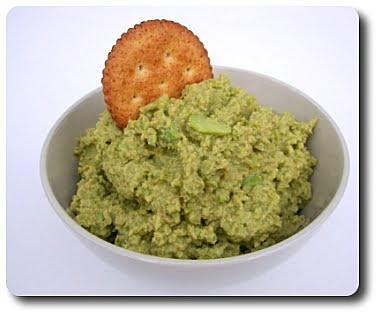 While the wait is a bummer, it does help and it gave us enough time to get the guacamole together! There isn't anything crazy or unusual here - a ripe avocado, fresh cilantro, a splash of lemon juice, a single clove of garlic, a pinch of cayenne and one more thing that Jeff won't admit was in this... raw red onion (he isn't a raw onion fan at all)! Not much, a couple teaspoons was all, but that's just enough for a mild bite... which passed muster without Jeff putting his veto stamp on this. To cook the burgers, we used a heavy cast-iron skillet heated with just barely enough oil to coat the bottom. Since there isn't really any raw ingredients in the patties, it only took a couple minutes on each side to brown them off and warm the centers. Served on our favorite homemade burger buns (toasted or not, do what you like! ), we smeared the bright guacamole on the buns, then added the patties, a couple lettuce leaves and a juicy slice of tomato on each. 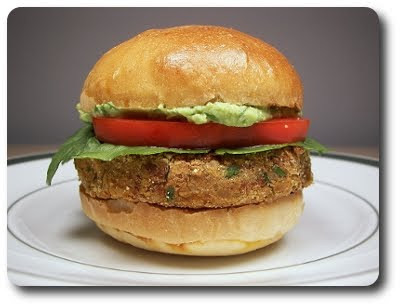 While it took about an hour from start to finish, all those ingredients and preparation did wonders to make what could have been an ordinary vegetable burger come to life! We thought we might make the drive back home in one fell swoop like we did coming out to PA, but we made it as far as Portage, Indiana and decided we were just too tired. After another 7 to 8 hour drive tomorrow, we'll be back home and start the process of getting back into our old routine. My plan is to start posting early next week, as soon as we restock the house and start cooking again. Jeff, the rest his family and I wanted to thank all of you, once again, for those comforting thoughts and prayers you sent our way - they helped us through a very tough time. With much sadness, I'm here to say Jeff's Mom passed away Saturday morning. We'll be busy over the next week with arrangements and family, but Jeff and I wanted to let everyone know how much we appreciate all the thoughts and prayers. I apologize for all this downtime on the website. Jeff's Mom had some serious complications with her surgery and has a very, very long recovery ahead of her. We were planning on staying for two weeks, but we may have to extend that due to these circumstances - we can only take it hour by hour at this point. However, before we left, I was able to make quite a few recipes that we haven't had a chance to talk about yet and I'm going to post as I can... like tonight! 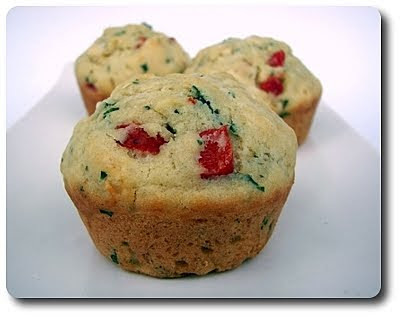 We've made plenty of savory biscuits before to serve along side for dinner and while I almost opted to make one of them again one evening, I decided to go a slightly different route and try out these Feta, Roasted Pepper and Basil Muffins! That's right, muffins don't always have to be sweet and in fact, there isn't any added sugar at all in these! I did use my usual flour combo though, using half all-purpose and half whole-wheat pastry flour to nudge up the nutrition. You can use completely all-purpose, use white whole-wheat flour or even regular whole-wheat, but with the last option, the muffins will end up a little more dense. 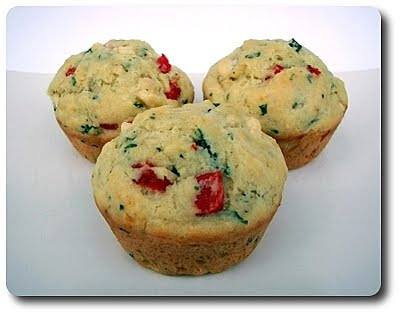 Now, instead of mixing in some sort of chocolate, nuts or other sweet things you'd normally find in a muffin, these use crumbles of salty feta cheese, chopped roasted red bell pepper and fresh basil! If you use a jarred red pepper, be sure to pat it dry before tossing it in - you don't want excess moisture from them running into the batter. You could just fold those ingredients in separately at the last moment and not dirty another bowl, but I stirred them together beforehand as I wanted to make sure they would be evenly distributed. One would typically use butter for sweet muffins, but this called for rich olive oil, along with buttermilk and an egg to moisten the dry ingredients. The easiest way to get the batter into the baking tin is using an ice cream or cookie scoop - this way you have much better control on how much gets into each muffin well. When they test done, checked easily by a toothpick or pressing on the top of a muffin to see if it springs back, leave them in the tin for just about five minutes before trying to tip them out. 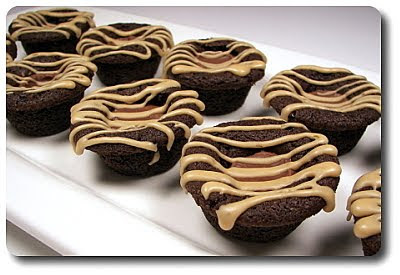 These muffins are very tender and need those precious minutes to firm up before being manhandled. 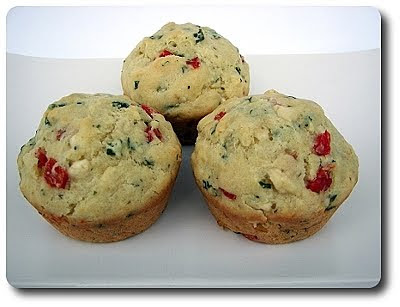 We both thought these were quite good as savory muffins, especially with those nuggets of feta inside, and was an admirable accompaniment to the soup we had. If you don't have the buttermilk called for, you can sour regular milk (or soy milk if you like) by adding a tablespoon of vinegar to the cup of milk. The basil was a welcomed addition, but fresh thyme (cutting the amount back to a tablespoon) would also be an excellent herb to use. Sorry for the downtime - things are kind of crazy around here! We found out a couple weeks ago that Jeff's Mom was having some heart issues. It turned out she needs surgery, so Jeff and I spent Saturday, with Gus in toe, driving from Minneapolis out to Pennsylvania. 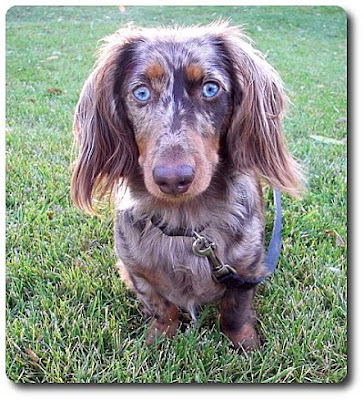 We are taking her in Monday morning (tomorrow) and she'll be in the hospital for close to 5 days. With us out here, we can take care of things during her long recovery time - we expect to be out here for at least two weeks. Gus is excited to be Mr. Therapy Pup! We often make sweet treats to snack on, but I had a wicked craving for something savory yesterday afternoon and I never found anything to satisfy that. A few hours after lunch today, that same tug came back... but this time I was prepared as I found this Edamame-Ginger Dip in my stacks of to-try recipe piles last night. You'll need shelled edamame for this, which isn't as hard to find as it was just a few years ago - I always pick up a few bags to keep in the freezer when we make the haul to the Trader Joe's close to downtown Minneapolis. The little soybeans, rich in both protein and fiber, don't require a lengthy cook time - a quick three to five minute dunk in boiling, well-salted water is enough to cook them through. The cooked bright-green beans were then tossed into our trusty food processor (I use this way more often than I thought I would! ), along with vegetable broth, soy sauce, rice vinegar, tahini (sesame seed paste), a full tablespoon of pungent minced ginger and a garlic clove. Once it was combined, we added salt to taste and for a little zip, a few dashes from our favorite cayenne pepper sauce. You don't need much - you could leave it out if you wish as the ginger brings some heat, but you know us and our love of spice! This won't be an ultra smooth puree as there is only enough extra moisture from the broth to process the beans to bits - however, we found this to be a benefit, rather than a hindrance. The resulting dip had texture and enough thickness that when we dipped in with homemade crispy pita chips we were able to grab up enough of it, yet it didn't break the chips or run off either. Be sure to give the dip a quick taste before you toss in the salt and hot sauce - with the salty soy, you won't need much and you may not want to add any extra if you are salt sensitive. Also, this benefits from a rest in the refrigerator before you dig in - this gives the ginger, tahini and garlic time to mellow and permeate through. If you wanted to be especially good and skip the chips or crackers, this would be an excellent dunker for crunchy fresh vegetables! Just like last week, I browsed through one of the new holiday baking magazines to figure out what we were going to make for the Weekly Wednesday Treat Day. Though, this week, Jeff needed to bring the treats in this morning as his office will be closed tomorrow... so, it was technically a Tuesday Treat Day! In the center of these Chocolate Caramel Espresso Chews hides a delicious candy that just happens to be one of my favorites - Rolo's! You know, those small chocolate covered caramel bombs that one (meaning me) could endlessly unwrap and pop in my mouth if I didn't worry about having a sugar coma. 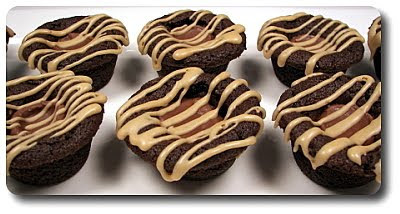 The dough for these two-bite cookies is devilishly dark, rick and laced with dissolved espresso powder, not only beefing up the chocolate-ness, but adding a very mild coffee zing. The recipe didn't state which cocoa powder to use - natural or Dutch-process, but we happen to enjoy the smoothness of the latter. 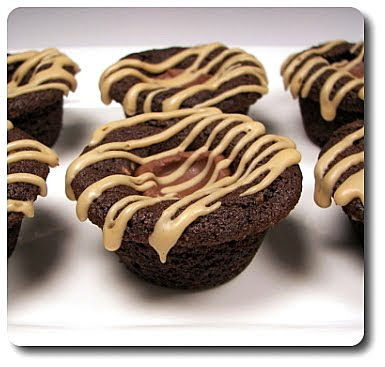 That isn't to say that these wouldn't be just as good if you used a natural cocoa powder - use whichever you have in the pantry. When combined, the dough was soft and pliable, almost on the verge of being sticky, but I was still able to divvy it out and roll the dough into balls without it sticking to my hands. I did use a tablespoon cookie scoop to portion out the dough, which ended up giving me just the right size pieces. If you find the dough to be a little sticky for you, keep your hands dusted with flour when rolling and that should help move the process along. To contain the cookies and give them height to be able to stick the candy inside, the ping pong-sized rounds were plunked into a miniature muffin tin and sent off into the oven to bake. The key to these is to not over-bake - take the tray out when the cookies have puffed up and the tops are set, yet if a toothpick is placed into the center, it may come out cleanly. If the toothpick comes out with raw batter, give them another minute or so, but don't worry if there are a few sticky crumbs. As soon as they were ready, we then took the chocolate covered caramels and gently pushed one into the center of each cookie. They are fairly delicate while warm, which means you'll want to leave them in the muffin tin for at least ten minutes before pulling them out. Once they had finished cooling, each cookie is topped off with a sweet, espresso-spiked drizzle made from confectioners' sugar, espresso powder and just enough hot water to thin. Thankfully, the full batch made a ton of cookies, because there was no way either of us was going to stop at just one! Doesn't he look all ready for summer again? I'm sure he will be shocked back to reality in a few weeks when the snow comes back! Before we went on vacation a few weeks ago, I picked up a bag of pitas and had good intentions to use them. However, I ended up tossing them into the freezer as time flew by and I never got around to them. I forgot about the little buggers until I did a quick sweep of the freezers to update the inventory list and figured it was time this week to bring them back out. 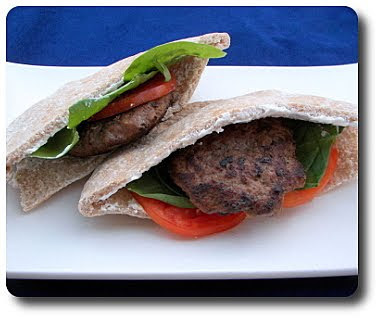 I moved them to the counter this morning to thaw so we could make these Moroccan Pita Sandwiches for dinner tonight! To prepare the patties we were going to slip into the soft pita breads, we worked quite a few ingredients into lean ground sirloin - finely chopped onion, a couple dollops of concentrated tomato paste, an egg, ground coriander, crushed fennel seeds, smoky cumin and two spices one might be more comfortable using in baking and not so much with savory meat.... cinnamon and ground ginger! Even if it seems too odd for you, go with it for now... you just might be surprised! Shaped into small rounds, if you have a large enough skillet, which we do, brown all of the patties at once, then slide them into the oven for a gentle heat to finish them through. If you have a smaller skillet, opt to do these in two batches so you give them enough room to cook in the pan. Since they finish in the oven, doing a couple batches isn't a problem as they will all end up being warm in the end. You could probably even do them all on the stove if you like, but we stayed close to the recipe this time and liked the even results we got from the quick oven trip. 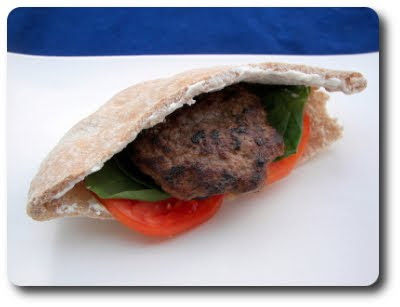 To add some moisture to the pitas, we whipped together a zesty sauce to spoon inside. Greek-style yogurt gave us a thick base to start, to which we added tahini, lemon zest, lemon juice and a single clove of minced garlic. For a bit of freshness and pop of color, thinly sliced tomato and little lettuce joined the party inside the pitas and we were set for dinner! Well-seasoned, with an interesting, complex twist from the sweet spices, the patties held together and stayed moist, but they were a bit on the small side for us. Both of us did comment how well we liked pairing the spiced burger with the sauce - so clean, refreshing and tangy! Those cupcakes we made for that Wednesday Treat Day not too long ago started a monster in my stomach that has been evil, annoying and loud enough that I caved and made more cupcakes (which we are greedily keeping to ourselves!). 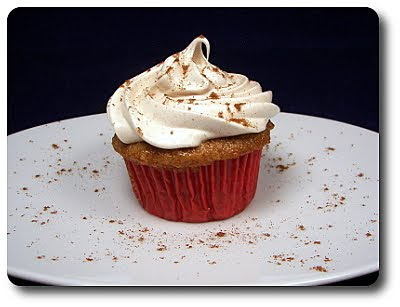 I was able to dig into our overflowing apple supply though, which made me feel a little better about making these Apple Cupcakes with Cinnamon-Marshmallow Frosting. It also pushed me to get in gear yesterday and dehydrate a few trays worth of sliced apples as the recipe called for them! We tossed just a bit of those diced, pliable dried apples with shredded fresh apples (Honey Crisp and Golden Delicious in our case) with a few tablespoons of brown sugar and cinnamon to stew while the rest of the ingredients came together. One of the bonus points for these cupcakes is how quickly the batter comes together - instead of waiting for butter to soften enough to cream, this recipe uses canola oil instead and pairs it with brown sugar for a rich depth. Lightened with a couple eggs and a splash of vanilla, the creamy concoction was primed for the dry ingredients - cake flour, whole-wheat pastry flour, cinnamon, salt and baking soda for lift. Whisked together ahead of time, those ingredients were alternately added with thick, tangy buttermilk to smooth the batter out. The apple mixture that had been marinating is finally folded in, creating the cupcake batter we scooped into our muffin tin. After baking and giving the cupcakes plenty of time to cool, it was time to start on the soft, caramel-esque marshmallow frosting. 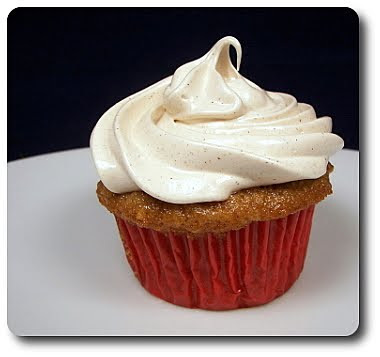 Unlike that lengthy, but luscious and butter-rich Swiss Meringue frosting we made for those other cupcakes, this frosting is made much like your classic seven-minute frosting in a bowl set over simmering water. 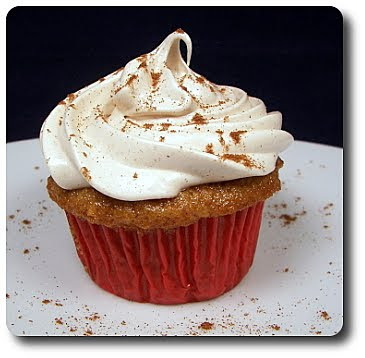 This one uses brown sugar though and is speckled with our favorite Vietnamese cinnamon to echo the flavor in the cupcake. As these cupcakes were just for us, I just went ahead and used a couple of fresh egg whites - if you're worried about using those, you can replace them with dried egg whites, reconstituted according to the package to the liking of two egg whites, or try using pasteurized eggs instead. Once beaten together, the frosting ends up being fluffy and thick, with a delightful shine to it, and indeed tasted just like an unset marshmallow (without the stickiness I might add!). My plan was to smear the cupcakes with the frosting using a spatula, but when I noticed how it retained the track marks from the mixer, I grabbed a pastry bag from the cupboard, fitted it with an open star tip and went to town! I feared it was just going to turn into a squishy pillow as it sat since the frosting was a little too soft to keep definitive sharp lines, but it actually set up and didn't fall! Keep that in mind though, if the frosting itself sits for too long, it will begin to firm and be harder to work with - make the frosting right before you are ready to frost them all. Remember how I talked about using canola oil instead of softened butter? That did speed up the prep time, but using that resulted in a texture that reminded me more of a moist muffin than a cupcake. I wouldn't say that detracted from the overall picture though as these apple-filled treats were the essence of fall all wrapped up in a compact edible package. 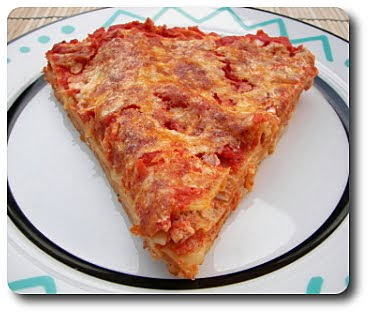 I was itching for tonight to come along so we'd be able to try out a new recipe for this evening's Friday Pizza Night. 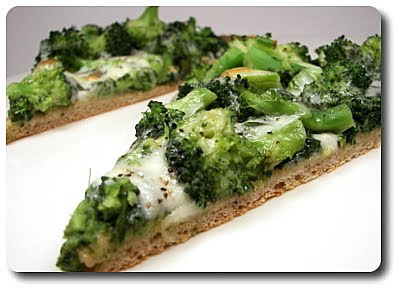 While the name, Green Pizza, certainly describes this pizza to a "T", I do have to admit it doesn't exactly get the taste buds juiced up. With that, it certainly made up for it taste wise! I fell back into my usual groove and hauled out the food processor to whirl together our favorite whole-wheat pizza dough with ease. While the dough was off relaxing, letting the yeast become happy and fed, I didn't have much prep work to do. This pizza calls for pesto, and I already had plenty in the freezer as I made sure to get a ton prepared when our basil plants were going crazy this summer. If I didn't have any already or didn't feel like throwing together a batch myself (though it only takes a few minutes! ), I would certainly take the help and pick up a jar or tub from the market! While I didn't have to make the pesto, I did hack away at a stalk of broccoli to chop the florets, slice up a mound of arugula and grate almost a full block of mozzarella cheese! Whew... what a work out - hee hee! When the dough had risen, we stretched it out into a large, but thin round, and slid it right onto a heated baking stone to start browning the crust. 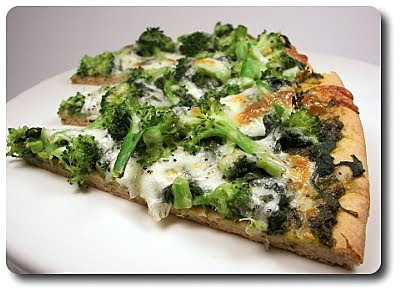 Because the broccoli and arugula will be lightly steamed, the pizza only needs to be baked long enough to melt the cheese... which wouldn't be enough time for the crust to get crispy! On the top of the partially baked crust, we slathered over the sharp pesto - which to me, at first, almost looked like an excessive amount. 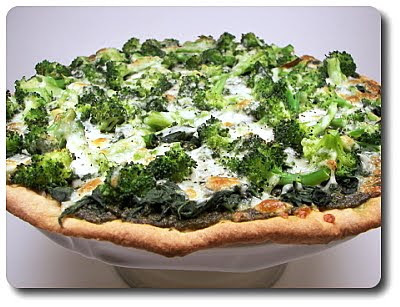 Before scattering the crisp-tender broccoli and wilted arugula (which was just done quickly in a skillet while the crust was baking) on top, I did double check to make sure it was well-seasoned with salt and fresh ground black pepper to ensure they would pop. The mozzarella was feeling left out of the love, so we took care to gingerly arrange each white shred to melt just right over the vegetables. Well, ok - you got me... that's a bit over the top and we did not do that... but it sounded good! I figured as much, and Jeff let me know before hand, that he wasn't expecting much with all those "good for you" ingredients smattering the top of this pizza... but you know what? While I did think that pesto layer was a bit heavy going on, the combination of the dynamic arugula and broccoli with the pesto made for a dinner that was not just healthy, but down right delightful! Jeff even gave it two big thumbs up and suggested this stay near the top when we have another repeat night. I thought about using a more assertive cheese, but we appreciated the mildness of the mozzarella. If the peppery arugula just comes across as being too bitter to you, don't skip this because of that - just use a milder spinach instead (though I would suggest a dash or two of crushed red pepper to add a zing). After an afternoon filled with errands and running around, I made sure to pick a recipe for dinner tonight that wouldn't involve too much, hoping to leave us with time to sit down and relax! A snazzy stir-fry sounded good when I was menu planning and I was only going to need to pick up one ingredient to get this Pork and Bok Choy Stir-Fry on the table this evening. Once the sliced onions had enough time to take their raw edge off, the ingredient I needed to pick up, bok choy, was stirred in to soften. Before tossing it in, we trimmed the bok choy and sliced the vegetable into long, thin strips. Besides helping the strips to cook evenly, having it in this shape will mimic the noodles, allowing the two to evenly combine and unite together. The pork is added next, but to help the protein cook quickly, we first sliced the lean tenderloin into thick matchsticks. Along with the pork, a few cloves of chopped garlic and dollop of chile-garlic sauce were added right in. With the pork in strips, it took just a couple minutes before it had cooked enough to bring the sauce into the party, which was a slick combo of water, Shao Hsing, soy sauce and a touch of cornstarch. 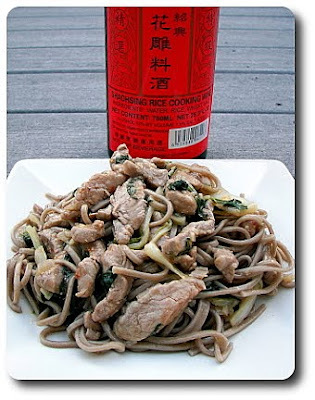 Shao Hsing, in case you didn't know, is just a rice wine - you should be able to pick up an your local Asian market or even the international section of your grocery store, but if you can't seem to get your hands on a bottle, dry sherry would be a good swap. 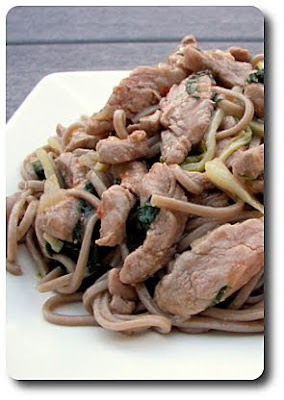 As soon as the sauce had thickened, clinging itself to the pork mixture, we finished the dish by pouring it over a mound of nutty soba noodles. Because the stir-fry comes together in a flash, plus we wanted to keep our attention focused, we actually cooked those noodles just before starting the dish and rinsed them in cool water so they wouldn't end up clumped together. I thought this was pretty good, but I do think there could have been a couple extra steps added that would have made a difference. If I were to do this again, I think I'd work with the strips of pork first, browning them a bit, then take them out and add them back in with the sauce to warm through. As instructed, the meat is fine and tender, but with it being cooked in a fairly juicy mixture, it lacked a depth that could have easily been attained. I also think a textural crunch would have been nice - maybe solve that with some chopped peanuts thrown on top before serving? Even though we've had bok choy once or twice, Jeff couldn't remember if he liked it or not, so he was a little apprehensive about it at first (he said it "looked slimy" - I think that had to do more with the fairly clear sauce though...). He changed his tune after trying it and gave it a thumbs up! 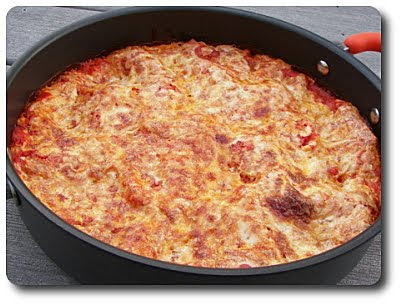 Preparing a simple tomato sauce was on the agenda one late afternoon earlier this week, which would give us the moisture we needed to get this Three-Cheese Skillet Lasagna on the table in time for dinner. Using a couple cans of whole, peeled tomatoes, we tossed them into our food processor and with a few touches of the pulse button, the tomatoes had broken down into a chunky puree. Could you get away with just using crushed tomatoes? Probably, but we liked the ability to control the texture of the sauce. Instead of just tossing all the components into the skillet, we first heated up a good layer of extra-virgin olive oil, then slipped the four cloves of finely chopped garlic in to briefly toast. The coarse puree was then poured in and once the tomatoes had come up to a rolling bubble, we eased off the heat and let the sauce simmer for a few minutes to let some of the excess liquid evaporate, tightening up the sauce. You'll want to do this in a large, deep skillet (rather than smaller saucepan) for two reasons - you want the depth so the mixture doesn't bubble all over you and the stove as the sauce simmers, but you'll also be assembling this lasagna right in the same skillet! When the tomatoes were ready, the sauce was poured out with a scant cup being added right back in to cover the bottom. A single layer of those functional no-boil lasagna noodles was arranged over the top of that sauce, breaking them to fit as needed, followed by a mixture of ricotta cheese, a golden egg yolk and of course, the obligatory salt and fresh ground black pepper to season. Another layer of noodles came after that, but this time a couple ladles of sauce was poured over before the third line of noodles were put in place. The ricotta came back into the show on this layer, followed by any remaining noodles we had scattered about and the last of the sauce. Since there had only been ricotta added at this point, we of course needed more cheese - a lofty amount of shredded fresh mozzarella was amassed on top, along with just a bit of grated pecorino for a final sharp component. We've mentioned this a number of times, but I think it's worth mentioning again - fresh mozzarella is pretty soft and can be difficult to shred, but a quick 15 to 20 minute trip in the freezer usually firms up the cheese enough to solve that issue. Baked right in the skillet long enough to cook the noodles through, you'll want to give this at least at ten minute rest before you start to portion it out if you want it to hold together. 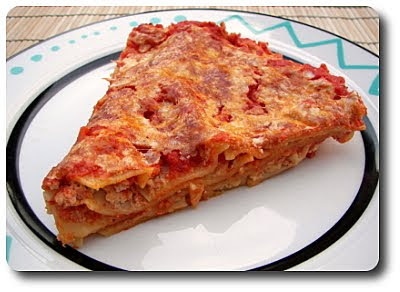 What this gives you is a very basic, mild-tasting lasagna that is clean, homey and definitely pretty quick to throw together. It is also a fairly blank slate if you want to ratchet up the flavor - doctor up the sauce with your favorite herbs, spices or crumbled browned sausage or meat. The ricotta mixture could also be tapped to add your own unique spin! Have you picked up any of the latest holiday baking magazines that have been flooding the market the past few weeks? I've nabbed a couple, but not nearly as many as I usually do - it seems there are lots of repeats from the past just being recirculated. 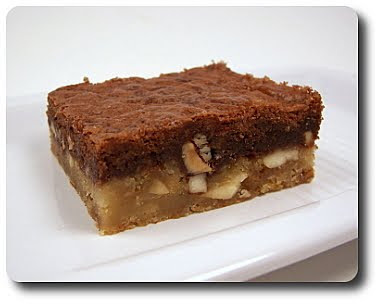 I browsed through them this weekend and while I've earmarked a few to try for our Christmas Baking Spree, I noticed these Double Decadence Bars and thought they would be a good match for the Weekly Wednesday Treat Day! 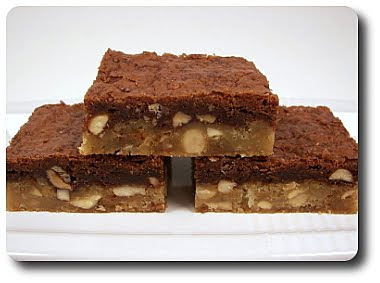 With these bars, you create one complete batter that you split off, leaving one half as is and darkening the other to get a duo of color and flavor. Before splitting the batter in half, we stirred in chopped salted peanuts and a full cup of crunchy toffee pieces. For that toffee, you can either whack a few bars of the chocolate covered candy to break them up or go for the bagged versions - which, conveniently, come plain as just toffee bits or come covered in milk chocolate. Since we already had a bag of the plain bits in the pantry, we went that route as I didn't want to add more sweetness in the form of milk chocolate. Once all the ingredients were combined, we scooped out half into a small bowl and stirred in a mess of melted bittersweet chocolate to richen the tan batter. Try to melt the chocolate at least a few minutes before you stir it in - slightly warmer chocolate will work itself in better, but you also don't want to start cooking the batter before it even gets in the pan. 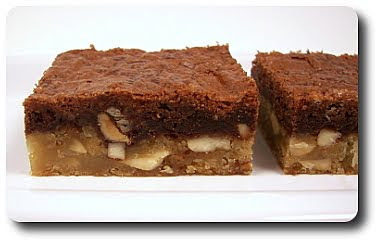 To layer the batters, the tan batter is spread over the bottom of the baking pan, followed by dollops of the chocolate batter that are then connected together to evenly cover. If you wanted to be different, are patient and yearn for a flashy appearance, one could always alternately spoon the two batters back and forth into the pan to end up with more of a two-toned block effect. When you test for doneness, use a toothpick and go towards the center of the pan - while you don't want to see any wet batter, a few moist crumbs attached is good. 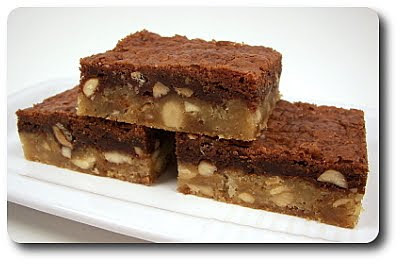 What I found with these bars is they are kind of a cross between a dense brownie/blondie and a good ol' sturdy bar cookie. They are chewy and crunchy, from the crumb of the bars and the chunky add-ins, and have a moistness to them that doesn't come across as gooey, yet they are not cake-like either. Confusing? Maybe a little, but "double decadence" definitely fits - I found myself especially attracted to their salty edge. While the peanuts matched well, Jeff thought cashews would be another nut that would be a notable pairing against the sweet bits of caramel-esque toffee bits. Since I knew we were going to have a busy week ahead of us, I needed to make a hearty casserole-type dish that would keep us fed for a few days in case we were short on time during the evening to make dinner. 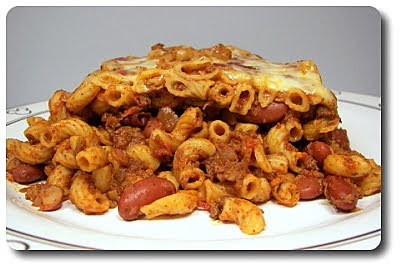 I thought a big batch of chili would fit the bill, but I wanted a little more oopmh, which we found in this Chili Mac I ended up making! A mess of onions, roughly two medium's worth, gave us a running start, along with a couple jalapeños for a little heat. When you add the onions in, go ahead and season generously with salt to help the onions along in the softening process - two teaspoons may seem a lot at first, but don't stress as this gets stretched out quite a bit. Lean ground sirloin was the meat of choice for us to add into the pot, however ground turkey, pork or chicken would be options to think about. The original recipe did call with two whole pounds, but we scaled that back by half a pound as we thought that may be excessive for us - feel free to knock that back up if you wanted a beefier result. Keeping the yield in mind, we kept the aggressive theme going with the seasonings, stirring heaps of Mexican chili powder, Mexican oregano and six large cloves of garlic, minced, in along with the beef. After giving the meat some alone time in the pot, the rest of the chili ingredients were tossed in - juicy canned whole plum tomatoes (coarsely chopped or broken with your hands), kidney beans and a little water to get a bubbly groove on. As the chili simmered away, we had another pot on the stove coming to a boil - we needed this to start cooking the protein-rich multi-grain elbow macaroni. This can be done before the chili is ready for it though - just rinse the noodles off in cool water to stop them from cooking. When the chili had thickened, the noodles and a handful of white cheddar were tossed into the pot... but we were not done just yet! 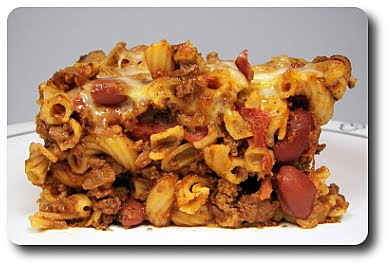 The pot, which was now very heavy being completely full, was tipped into a large casserole dish - which at first, didn't look like it was going to hold all this chili mac! Smoothing it out with a spatula (and pressing it down a bit) allowed it all to fit it, albeit very snugly, but then I started to think about spillage... a baking sheet underneath was called for just in case - cleaning oven messes is no fun at all! As with most casseroles, we needed a cheesy topping, which came in the form of more sharp white cheddar scattered all over before this went into the oven to bake through. 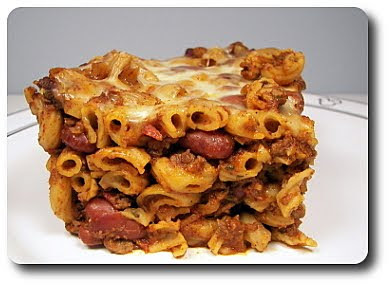 To be completely honest, the original recipe did call for a whopping pound of cheese -but again, for us, that seemed way over the top. If you're a cheese hound, by all means add as much as your heart desires, but yes, we scaled that back and didn't find the dish suffered at all. We ended up dividing this out into eight portions, which left us completely stuffed to the brim and happy with plenty of leftovers for the week. However, I think this could easily stretch to at least 10 portions and still be satisfying. You'll see how neat and tidy some of the portions we plated were - this was after letting the dish rest about fifteen minutes. We first let it rest about 5 minutes and pulled out the first piece, which resulted in this - a little messy, but the rich aroma started our stomachs rumbling and we just didn't want to wait!